Fall Prevention Resources Now Available! 2015 MFCs have been released! We are hoping to see a high attendance rate, and lots of great stories, pictures, and even company logos! If you haven’t had time to plan an event, here is a great guide to help you. It’s never too late to join in! Since the change in the OSHA recordkeeping requirement went into effect on January 1, 2015, over 10,000 severe injuries have been reported. This has presented OSHA with the opportunity to work with employers on eliminating hazards to make the workplace safer and to protect more workers. According to the national news release many employers have followed, and even exceeded, the new requirement although not all employers were quite so eager to participate. For guidance on Recordkeeping, visit https://www.osha.gov/recordkeeping/index.html. 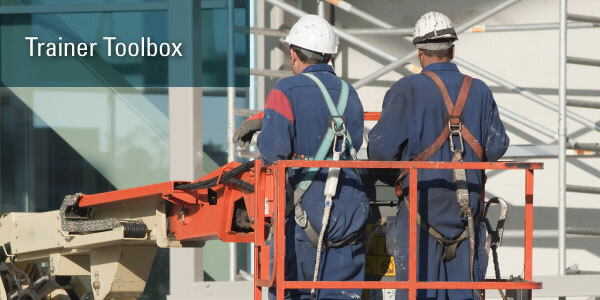 Order New OSHA 10-HR, 30-HR, 7600 Completion Cards – This is where you go to submit your trainer report to order OSHA completion cards for the students who completed the class. On the page where you select the type of class you conducted, we have added a section to mark any special circumstances that may apply to the class. If none of them apply, you simply proceed to the next page. If you are uncertain of whether or not you have a special circumstance, you can always contact us! Replace Damaged, Lost or Misspelled OSHA Cards – If something happened to your trainer card or one of your student’s cards, this is where you go to order a replacement card. Make sure to select the correct card type (there will be two selections–student card or trainer card). Please note, if a student card is misspelled or damaged we will need the original one returned to us before we can issue the new one. If a student card is lost, we will need a copy of the original card emailed to us. Access Outreach Training Resources – Here you will find many great PowerPoints, handouts, videos, and other great tools to help you with your training. There is also an updated PDF with step-by-step instructions on how to order cards. Update Outreach Trainer Contact Information – You now have the ability to update your contact information anytime you need to. Whether it’s an email change, a phone number change, or a complete address change, you can update it all with just the click of your mouse! 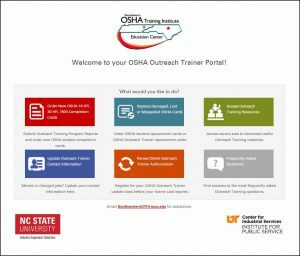 Renew OSHA Outreach Trainer Authorization – As you already know, your trainer authorization expires 4 years after your trainer course end date. When in doubt, check the bottom right corner of your trainer card for the expiration date and make sure to sign up for one of the classes found in this section to renew your trainer status. Frequently Asked Questions – We receive many great questions and have decided to post the answers to the ones that are asked most frequently. If unable to get a hold of us immediately, this is a great place to check! Additionally, at the very bottom of the page there are some awesome tips to ensure your recordkeeping is meeting all of the requirements.